AUGUSTA, Syracuse, Italy , May 11 2015 (IPS) - Not even a month has passed since over 700 hundred migrants lost their lives in their attempt to reaching the shores of Italy and the media spotlights have already faded on the island of Sicily, Italy’s southern region and main gateway to Europe. Yet, the migration flows have not stopped. Five days ago, on May 3, 300 people arrived in the port of Augusta, in the province of Syracuse, and among them were 19-year-old Ahmed and 22-year-old Mohammed. Both come from Somalia but they met in Libya, where they had worked for several months in order to save enough money to pay the smugglers running the traffic in migrants across the Mediterranean. 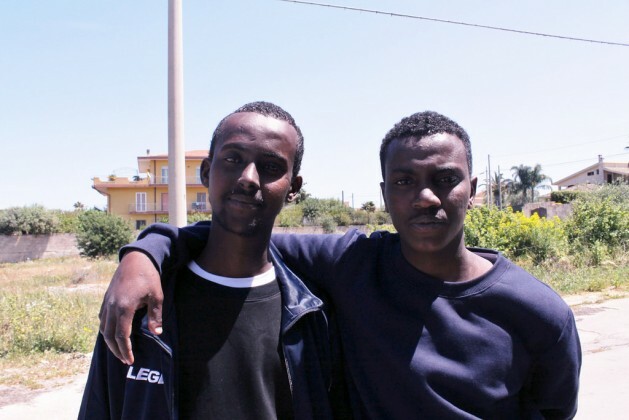 Ahmed and Mohammed are now hosted in one of Syracuse’s first aid and reception centres, but they are not planning to remain in Italy for long. Ahmed wants to go to Belgium, where some of his relatives already live, while Mohammed hopes to continue his trip towards Germany. Crossing the Mediterranean was frightening, but they seem to have left all of their fears on the Libyan shores and their eyes are full of hope for the future. “The sight of the sea from Libya was so scary, but when I look at it from here, it’s beautiful again,” says Ahmed, who is hoping to be able to study in Europe and become a doctor. Before leaving Libya, Ahmed had heard about the tragedy of the 700 who lost their lives, but that did not stop him because, he says, the risks are higher in Somalia than on the boats. Despite the fact that more than 25,000 migrants have already made it to Italy this year, the actual ‘migration season’ is just about to start. Meanwhile, Europe is lurching to answer southern European states’ request for help. Currently, the Mediterranean is patrolled under Operation Triton, a border security operation conducted by Frontex, the European Union’s border security agency, which aims to deter migrants. Operation Triton replaced Operation Mare Nostrum, which had been a broader Italian search and rescue initiative. During an extraordinary European summit on the refugee crisis in the Mediterranean held on Apr. 23, E.U. leaders agreed to triple funding for rescue operations in the Mediterranean, but this is far from being the ‘European solution’ to the migration crisis. “Of course more capacity and more boats and early detection by planes increase the possibility of saving more people,” the Frontex press officer in Catania, Ewa Moncure, told IPS. While E.U. leaders continue to discuss possible naval blocks off Libyan territorial waters and southern European states try to open a debate on quotas of refugees to be shared among all member states, local authorities and Sicilian citizens are left with the task of handling the first aid and reception operations. Augusta, a town of around 40,000 inhabitants, is one of the main bases of the Italian Navy in Sicily and it served as the headquarters of the Mare Nostrum operation, until it ended in October 2014. Between April and October 2014, the town also hosted an emergency centre for unaccompanied minors, raising concerns and complaints of around 2,000 people who signed a petition to move the centre somewhere else and to propose naval blocks at the departure ports. “This petition suggested exonerating from the allocation of migrants those municipalities that already suffer from economic insolvency and high unemployment levels, as is the case of Augusta,” Pietro Forestiere, local spokesperson for the right-wing Fratelli d’Italia party and one of the initiators of the petition, explained to IPS. The emergency centre of Augusta was eventually closed in October, but its example could be easily extended to the whole region, which suffers from the highest levels of poverty and the second highest unemployment rate in the whole of Italy. Yet, despite the voices calling for strong action against immigration, it is very common to hear people in Augusta sympathise with the migrants, especially when it comes to refugees.